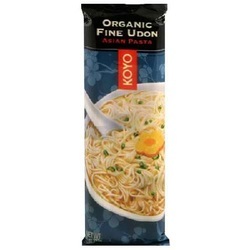 Koyo Organic Fine Udon Description Asian Pasta Expertly crafted in the traditional roll-and-cut manner from freshly milled, organically grown heirloom wheat. Enjoy this quick-cooking, nutritious Koyo Fine Udon in soup, or like spaghetti with topping or sauce. Disclaimer These statements have not been evaluated by the FDA. These products are not intended to diagnose, treat, cure, or prevent any disease.